SAC COMUNICA CHE DAL 20 DICEMBRE E FINO AL 6 GENNAIO, NELL’AEROPORTO DI CATANIA (PIANO ARRIVI, AREA CONSEGNA BAGAGLI), SARÀ IN MOSTRA LA COLLEZIONE DI PRESEPI IN TERRACOTTA E CERAMICA ARTISTICA DI CALTAGIRONE. UNA RACCOLTA DI PROPRIETÀ DEL DIPARTIMENTO DEL TURISMO, DELLO SPORT E DELLO SPETTACOLO DELLA REGIONE SICILIANA. L’ESPOSIZIONE NASCE DA UNA COLLABORAZIONE FRA IL COMUNE DI CALTAGIRONE DE LA SAC. OGGI L’INAUGURAZIONE, ALLA PRESENZA DELL’AD DI SAC, NICO TORRISI, E DEL SINDACO DI CALTAGIRONE, GINO IOPPOLO. PROPRIO NELL’AREA ARRIVI, LUOGO PRESCELTO PER L’ESIBIZIONE, È PREVISTO NEL MESE DI DICEMBRE, CON PICCHI NEL PERIODO NATALIZIO, UN TRANSITO DI OLTRE 700.000 PASSEGGERI, CHE POTRANNO AMMIRARE COSÌ UN SAGGIO DI QUESTA PREZIOSA RACCOLTA: PEZZI UNICI, REALIZZATI A MANO CON TECNICHE DIVERSE GRAZIE ALLA RINOMATA MAESTRIA DEGLI ARTIGIANI DELL’ANTICA TRADIZIONE CALATINA. LA COLLEZIONE, CHE NEL PASSATO È STATA ESPOSTA NELLE PRINCIPALI CITTÀ ITALIANE ED EUROPEE, RAPPRESENTA UN VALIDO STRUMENTO PER PROMUOVERE LA CITTÀ DELLA CERAMICA CHE, SPECIALMENTE DURANTE LE FESTIVITÀ NATALIZIE, METTE IN MOSTRA I PRESEPI PIÙ BELLI, FACENDO REGISTRARE UN’IMPENNATA SIGNIFICATIVA DI VISITATORI. SECONDO L’ASSESSORE REGIONALE AL TURISMO SANDRO PAPPALARDO SI TRATTA DI “UN MODO EFFICACE PER ACCOGLIERE I TURISTI, STIMOLANDO LA LORO CURIOSITÀ ATTRAVERSO UNA PICCOLA ANTICIPAZIONE DELLA BELLEZZA CHE GLI ARTIGIANI CALATINI HANNO SAPUTO COGLIERE NEL RAFFIGURARE LA “NATIVITÀ” MISTERO DAL QUALE HANNO ORIGINE LE NOSTRE RADICI CRISTIANE. UN RINGRAZIAMENTO SENTITO AI VERTICI DELLA SAC E AL COMUNE DI CALTAGIRONE PER AVER FAVORITO, CON LA LORO CONSUETA E SEMPRE APPREZZATA COLLABORAZIONE E SENSIBILITÀ, LA REALIZZAZIONE DELL’INIZIATIVA”. “CALTAGIRONE, NEL PERIODO NATALIZIO – AFFERMA IL SINDACO GINO IOPPOLO – SI PRESENTA NELLA PROPRIA VESTE MIGLIORE, OFFRENDO AI VISITATORI MILLE OPPORTUNITÀ PER TRASCORRERVI INTERE GIORNATE IN UN APPREZZATO MIX DI MOSTRE, EVENTI, MERCATINI, CONCERTI, SPETTACOLI E MUSEI APERTI. PROTAGONISTI INDISCUSSI SONO I PRESEPI, FRUTTO DELLA SAPIENTE OPERA DEI NOSTRI ARTIGIANI E REALIZZATI, OLTRE CHE NELLA CERAMICA CHE DA MILLENNI CARATTERIZZA LA NOSTRA CITTÀ, ANCHE IN TANTI ALTRI, ORIGINALI MATERIALI. RINGRAZIO L’ASSESSORATO REGIONALE AL TURISMO PER LA PREGEVOLE INIZIATIVA E LA SAC PER LA COLLABORAZIONE PRESTATA”. 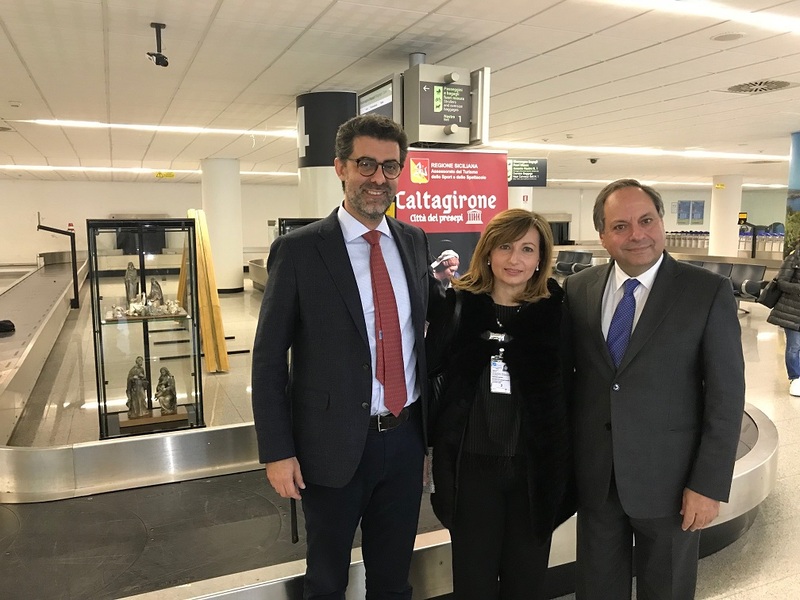 “ACCOGLIAMO CON GRANDE GIOIA – DICHIARANO LA PRESIDENTE SAC, DANIELA BAGLIERI, E L’AMMINISTRATORE DELEGATO NICO TORRISI – LA COLLEZIONE DEI PRESEPI DI CALTAGIRONE NELL’AEROPORTO DI CATANIA. 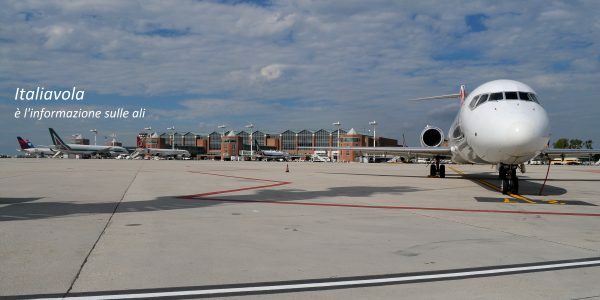 E NON È UN CASO LA SCELTA DI ALLESTIRE AGLI ARRIVI: IL PRIMO SPAZIO CHE, ALL’INTERNO DEL TERMINAL – ‘NOTORIAMENTE UN NON LUOGO’ – ACCOGLIE IN SICILIA LE DECINE DI MIGLIAIA DI VIAGGIATORI CHE OGNI GIORNO ATTERRANO A CATANIA E CHE IN QUESTI GIORNI DI FESTA SI RICONGIUNGONO CON I PROPRI FAMILIARI. LA MAGIA DEL PRESEPE, RITO ANTICHISSIMO DEL NATALE CRISTIANO, INSIEME ALLA SAPIENZA DEGLI ARTIGIANI DI CALTAGIRONE SONO IL BENVENUTO “MADE IN SICILY” PER TUTTI I PASSEGGERI IN ARRIVO, ALL’INSEGNA DELL’ACCOGLIENZA E DEL RITROVO DEGLI AFFETTI PIÙ CARI”. L’ALLESTIMENTO SARÀ CURATO DAL SERVIZIO TURISTICO REGIONALE DI CATANIA, AL QUALE È AFFIDATA LA CUSTODIA DEI PRESEPI.